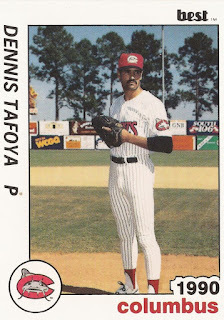 Dennis Tafoya showed dedication and commitment to the community as a reliever for the Carolina Mudcats in 1993. He also showed an unselfish spirit, according to MiLB.com. For those traits, the team awarded Tafoya its inaugural Ed Hales Award, given each year for players who show those qualities. Tafoya won the award in his seventh professional season. He saw AAA briefly the previous year. He'd never see the majors. That season with Carolina turned out to be his last. Tafoya's career began in 1987, taken by the Astros in the 25th round of the draft out of Cal State-Sacramento. Tafoya started with the Astros in the rookie Gulf Coast League. In 19 outings, he posted a 2.61 ERA. He played at single-A Asheville and short-season Auburn for 1988, then high-A Osceola for 1989. He went 7-7 for Osceola that year, saving 12 games. He gave up four earned in three innings of work in an April game. For 1990, he split time between Osceola and AA Columbus. He got into 31 games for Columbus, going 0-5, saving two and amassing an ERA of 6.75. Tafoya moved to the Pirates and AA Carolina for 1991. In 40 outings, he posted a career-best 1.99 ERA. He picked up one of his saves in a June game. He then returned to Carolina for 1992. He also got a brief look at AAA Buffalo. In five outings there, he gave up five earned for a 4.35 ERA. He picked up a win in relief in a July game. His final season came in 1993 at Carolina. He went 5-4, with a 3.09 ERA, ending his career.